One of the world’s longest and best-preserved fortifications, the Western Ramparts comprise a unique defence installation of more than 14 kilometres, stretching from Utterslev Bog in the north to Avedøre in the south. It’s a great place for a workout. But it’s also a special place in which to get closer to history or appreciate the natural world. 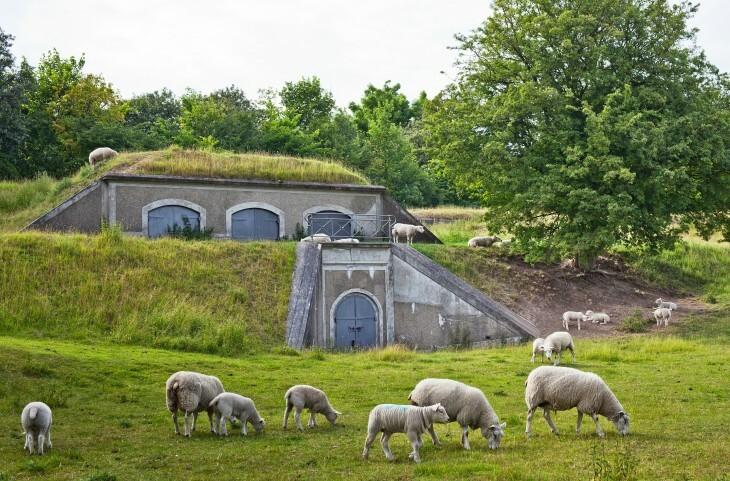 Many traces remain of the days when the ramparts protected the nation’s capital from its enemies, including a moat, underground facilities and, at the southernmost point in Avedøre, an old airfield with two preserved wooden hangars from the First World War. Today, the Western Ramparts are a popular recreation area. It is an ideal place to run or walk, even when it is dark; most of the ramparts are paved and illuminated at night. Cyclists can try four challenging courses in Husum, Rødovre, Brøndby and Hvidovre. All are suitable for regular bikes or mountain bikes, and are ideal for children and adults alike. It’s the perfect place to practice tricks with your bike and get your pulse racing. In total, there are 10 kilometres of asphalt, an ideal location for roller-skating in safe conditions, surrounded by history. If you fancy something less strenuous, there’s a smartphone app that relates stories about the days when the Western Ramparts served as fortifications. Why not play the mobile-phone games ‘Lost in Time’? Or ‘Cold War Spy’, in which you try to stop World War III? The latter is set in Ejby Bunker, which the Danish armed forces used right up until 2005. Despite being in the middle of Denmark’s most densely populated area, the Western Ramparts also offer a rich variety of flora and fauna, including several rare species. Their location makes the ramparts particularly valuable. They act as a corridor that enables plants and animals to spread from place to place, so they are not isolated in a few green pockets in built-up areas. This helps to keep population levels high and ensures they continue to reproduce. One of the largest-ever Danish construction projects, the Western Ramparts were further developed between 1888 and 1892. During the First World War, more than 50,000 soldiers prepared for combat here, although ultimately, Denmark did not enter the war. The Western Ramparts and the rest of Copenhagen’s fortifications have not served as defence installations since 1920. Built in 1954, Ejby Bunker played an important role during the Cold War and in Denmark’s Danish missile-defence system. Traces still remain of the days when the Western Ramparts acted as fortifications, including hawthorn bushes – nature’s own barbed wire. Many rare plant species, including the wild orchid, Common Twayblade. Foragers will find several types of morel fungus here. This is the only place in the world to find one of them, verpa bohemica. The canals are home to great crested newts, common frogs and toads, as well as several kinds of dragonfly and other insects. Fish species include eel, pike, perch, roach and carp. Foxes, squirrels and other mammals are frequently seen, as are a number of birds of prey. The ramparts are difficult for wheelchairs to access. Several cafés, including in the Artillery Magazine in Rødovre. From small, intimate spots, to the amazing harbour baths, to the wild, natural scenery on the outer edges. Copenhagen Green is your guide to 100 green places in the city. Created by Life Exhibitions for Foreningen By&Natur.